Did You Know Shah Rukh Khan Was Karan Johar's Gym 'Trainer' At Some Point? If you are startled by the subject of the story, so are we. But one thing is for sure that there are more shades to the Shah Rukh Khan and Karan Johar friendship than we know already. In a recent throwback photo shared by Karan Johar, the filmmaker revealed that the 52-year-old superstar, apart from being a great industry friend, also doubled up as his gym trainer at some point - by that we mean 2009. We are not sure if by that time Shah Rukh had already started shooting for Karan Johar's My Name Is Khan which released in 2010, but the duo sure did sweat it out in the gym together - or, on Karan Johar's part, he tried at least. "When Shah Rukh tried his level best to train me in 2009!" 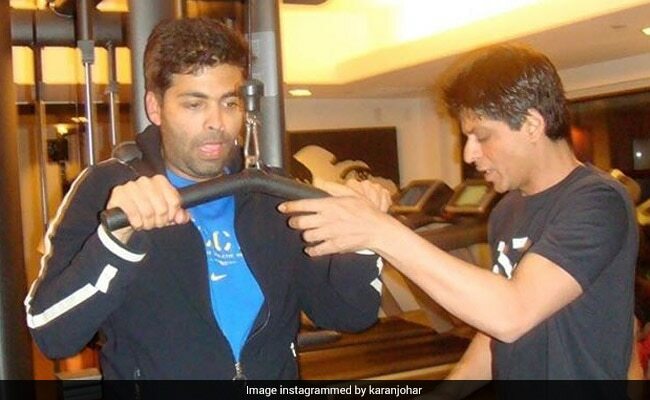 Instagrammed Karan, along with a photo, in which Shah Rukh can be seen helping Karan with weights. Check out this piece of throwback gold. Karan Johar and Shah Rukh Khan often feature in priceless throwback photos on social media and one of our favourites is the one with which Farah Khan managed to embarrass their superstar friend at a party. Shared by Farah Khan earlier this year, the caption read: "Shah Rukh Khan looking rather embarrassed at my antics with Karan Johar," while Shah Rukh replied: "And you are doing it all over again! We should have another night like this, I still have the shirt." Shah Rukh Khan was the hero of Karan Johar's first directed project Kuch Kuch Hota Hai and the duo have also worked together in films like Kabhi Alvida Naa Kehna and Kabhi Khushi Kabhie Gham..., which clocked 16 years this month. And this is how KJo remembered the good days from when the film was being shot. Over the years, Shah Rukh Khan has made multiple appearances on Karan Johar's talk show Koffee With Karan and now, viewers will see Karan Johar as Shah Rukh's guest on tonight's episode of TED Talks India.